We’re in Cyprus for a few days, to celebrate Partho and Marilena getting married. This post will cover the first part of the trip, which we spent in Limassol before the wedding. Travelling with Owen is far more stressful than just Jen and I. We tried to get everything organised in advance, but then Monarch, the airline we’d booked with ceased trading and we had an extra stressful few days rebooking. We ended up paying double the price and having to fly from Stansted, rather than Birmingham, which made it a really long day travelling. Owen slept all the way to the airport, but seemed to enjoy taking in all the sights of the airport – the bus from the car park, the security check, the train to the gate etc. He was mostly well behaved on the plane, but four hours is a long time for a little boy to be sat on his Dad’s lap in such an exciting environment. He made friends with a little Norwegian boy sat in front of us, and the girl sat next to me, who just happened to work in a nursery, so was used to inquisitive little boys. I felt sorry for her a bit – she was probably looking forward to a holiday away from small children! Getting through Larnaca airport was fairly easy, apart from when Owen decided to wee everywhere when we were changing his nappy. I guess it was inevitable after he drank a bottle of water on the plane. Our “Golf or similar” turned out to be a Nissan Pulsar, which was fine, for the 45 minute drive to Limassol. For some reason Apple Maps gave us a route, but didn’t give us turn by turn directions. Then when we switched to Google Maps it insisted on spelling out the road names Greek letter by Greek letter. Just as we got to the hotel, Partho phoned to suggest a nightcap, so it was a case of checking in, transferring the now fast asleep Owen into his cot, then straight to the bar for me to catch up with Partho and Rich, who was already at the hotel. Jen stayed with Owen, but I did bring some beers back, and it was nice to sit outside on the balcony, listening to the sea lapping against the shore. We decided to keep Owen on UK time (Cyprus is two hours ahead), so it was 9:00 before we got to the breakfast buffet. It was lovely sitting outside on the terrace for breakfast, but it was already getting warm! After breakfast we explored the pool and beach areas and walked up to the shops to get some supplies for Owen. All the heat and excitement must have tired him out, as he was asleep by the time we got back to the hotel. Jen took the opportunity to go for a swim in the adult only pool, whilst I stayed in the air conditioned room with Owen – working on my best mans speech. When Owen woke up we drove to the Colours Cafe at the Four Seasons hotel, where Jen and I had shared a huge ice cream sundae on our previous trip to Cyprus in 2011. The cafe had been redone recently and it looked very swanky, however the highlight was the long counter with ice cream, cakes and pastries on display! We had lunch whilst waiting for Partho and Marilena to join us for ice cream. I was surprised to see chicken curry pie on the menu, so I had to order it to share with Owen. I thought it was amazing, but Owen didn’t even want to try it – his loss was my gain. When we eventually got ice cream and cakes, Owen’s appetite had reappeared, and he did a good job helping us to polish off our chocolate sundae. Disappointingly the sundae was only half the size of the one we’d had on our previous visit. I also found out more about what my best man duties would entail, complete with a warning that if I messed up my duties during the ceremony, the wedding would have to be postponed until the next day. The other posts from this trip are now live: Partho and Marilena’s Wedding and Relaxing in Protaras. 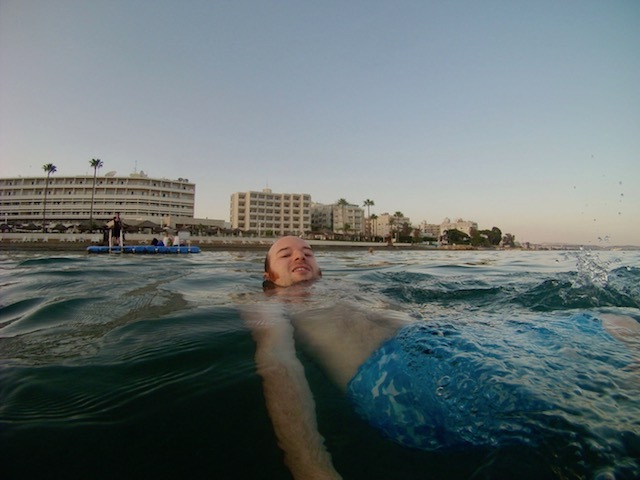 This entry was posted in Travel and tagged Cyprus, GoPro, Limassol, Photo, Selfie, Swimming by Lewis. Bookmark the permalink.